Please note that the quantities below may change depending on the size of the apple you mold with. Prep: Put on your vinyl gloves and combine Part A and Part B of the single use flexy fast. I love using this size because you’ll always get the proportions correct. Stretch and fold the mixture just like a taffy machine. When your mixture is a soft bubble gum pink color it’s ready to mold. Tip: Vinyl gloves are important. 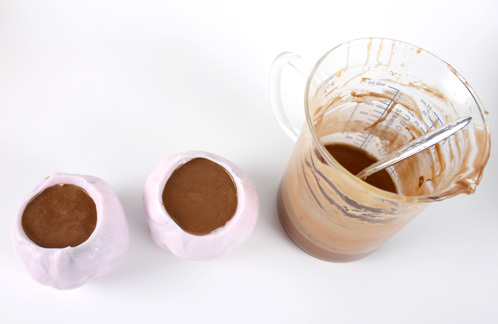 Plastic or latex gloves will stick to the putty making a gloppy mess. Check out more tips for flexy fast success here. 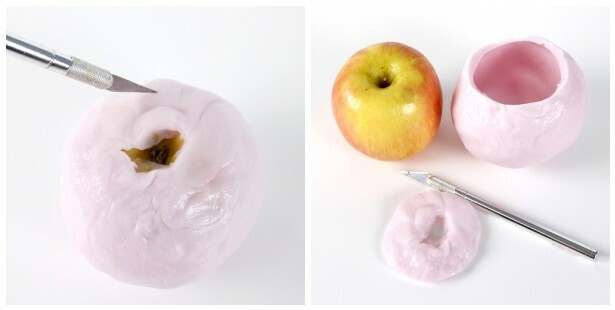 Molding the Apple: Carefully form the putty around your Apple. Really press the putty into the apple to ensure that you get all of the realistic details and to release any air bubbles. Make sure there are no holes in the putty that the soap could potentially leak through. Leave a really small hole at the top of the apple. We’ll trim the top up later so it doesn’t have to be pretty. While the putty is pliable, you have about a minute to work so work fast. Once fully formed, let the mold dry for about 30 minutes. Trim the Mold: When the putty seems to be dry, cut off the top of your mold with a craft knife (which will be the base of your apple). Having a clean cut line will prevent tearing when unmolding your apple. Time to Make the Soap! 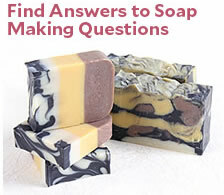 ONE: Melt and combine 8 ounces of clear melt and pour soap base and 8 ounces of white melt and pour soap base. This will give us an opaque color without it being too light in color. TWO: Add colorant and fragrance combination. Mix well. Then pour the soap into your respective handmade mold and let the soap cool for about an hour. 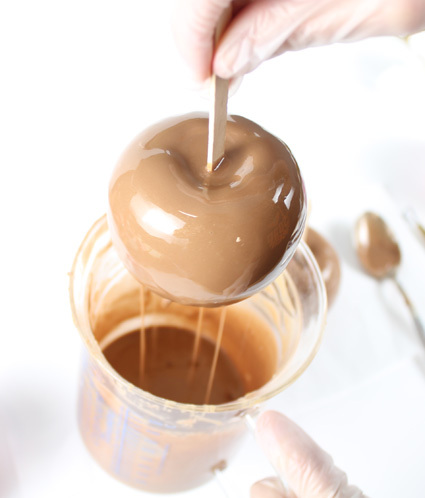 Chipotle Caramel is such a delicious smelling fragrance oil, you’ll really think you’re making caramel apples (no, really). Color Combination: 2 parts Liquid Brown, 1 part Liquid Yellow and 1 Part Gold Sparkle Mica. As you can see in the picture at the bottom of the post, I played with several “caramel” color combinations so have fun with this part and customize your own custom caramel color. Let me know what you like the best! Alternate Fragrance: 2 parts Red Apple to 1 part Caramel Sundae. The combination is soooo yummy! 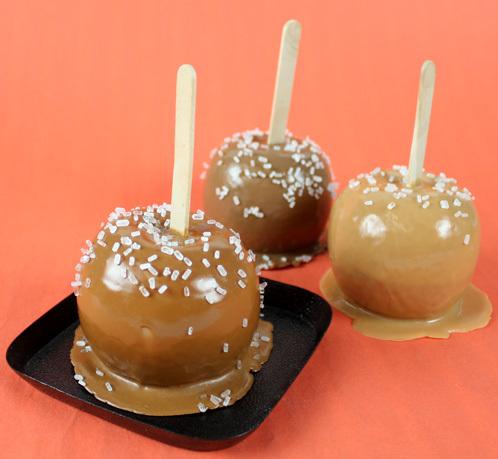 I made several caramel apples; they were so cute I just couldn’t stop. THREE: After an hour of cooling time, unmold the soap making sure it’s hard enough to unmold but still a little warm. This is the key to adding the craft stick with ease. It will be a little more difficult if the soap has completely cooled. Then press your craft stick to the top of the soap (where the stem would be on the apple). FOUR: You should have about a cup of caramel colored soap left over (give or take depending on the size of your apple). Melt that back down and let it cool to about 140 degrees. 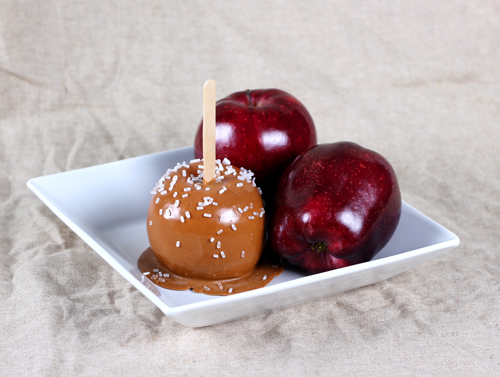 Then dip your apple soap into the melted caramel colored soap just like you’re making a real caramel apple. 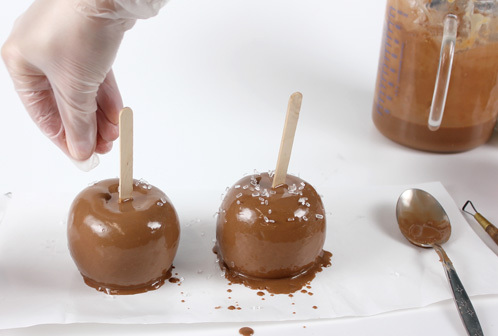 FOUR: Drips and all, plop the caramel apple on wax or freezer paper and let the soap drip down just the sides like real caramel. And while the soap is still warm add “sprinkles”! We used Coarse Epsom Salt but Jojoba Beads would be fun too. 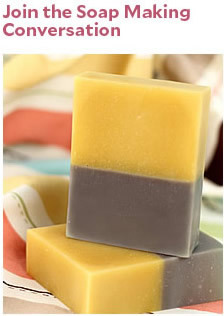 Let the soaps dry and use a mini spatula to peel the soap away from the wax paper.